The Father Christmas Letters by J.R.R. Tolkien (alternate title: Letters from Father Christmas) is a delightful volume for personal or family reading during the Christmas season. With Tolkien’s skillful storytelling abilities and charming illustrations, the book can quickly become a holiday favorite. In this post we will explore some of the historical context for the letters and provide a brief overview of the book. Each year in the Tolkien household from 1920 until 1943, Tolkien’s four children John, Michael, Christopher, and Priscilla could expect a letter delivered to them from Father Christmas (the name for Santa Claus in England), complete with news about the happenings at the North Pole over the past year and accompanying illustrations. Each letter was carefully written in the shaky handwriting of Father Christmas (for he was over 1900 years old after all), and bore an “authentic” North Pole stamp. Sometimes the letter would appear in the home dusted with snow or with snowy footprints across the floor; other times it would be delivered by the postman, making the arrival seem very official. The children’s own letters to Father Christmas would likewise disappear from the fireplace and make their way magically to the North Pole with their own news and Christmas present requests. When the elder children stopped writing to Father Christmas, all family members encouraged the younger ones to keep up the correspondence, maintaining the delight of the holiday ritual. The content of the letters varied over the years as Father Christmas moved house, had several adventures, and gained more members of his household and the North Pole community. Characters mentioned include Snow-elves, Snow-men, Red Gnomes, Cave-bears, Goblins, and Father Christmas’s personal secretary, an Elf named Ilbereth. One character who maintains a consistent presence in the letters is Father Christmas’s assistant, the North Polar Bear. Some of the most memorable letters include stories of how Polar Bear’s foibles and curiosity often, while trying to be helpful, lead to accidents and disasters. These include causing the North Pole to break and fall on Father Christmas’s home, falling down a staircase with a pile of gifts, letting the bath water overflow, and setting off two years’ worth of northern lights all at once. These accidents sometimes account for deficiencies in the gifts Father Christmas has brought the Tolkien children, and in other cases are meant solely for comedic and dramatic purposes. Polar Bear offers his own commentary with his distinctive angular script in the letter margins, with occasional contradictions of some of Father Christmas’s accounts of how the accidents happened. Polar Bear proves very helpful in later North Pole events, however, when he battles invading Goblins. His nephews, cubs Paksu and Volkotukka, also join Father Christmas’s household in later letters. And with every letter, Tolkien’s accompanying artwork brings the story to life in enchanting ways. As many readers may already know, Tolkien created a great deal of artwork for his writings such as The Hobbit, The Lord of the Rings, The Silmarillion, and other tales he wrote for his children like Mr. Bliss and Roverandom. He studied art from an early age with his mother and it remained part of his creative expression throughout his life. Seeing Tolkien’s depictions of the Aurora Borealis blaze in full color over the North Pole horizon, or Polar Bear in the thick of a goblin battle, adds greatly to the reader’s enjoyment of the tales, as the illustrations must have done for the Tolkien children as well. Several editions of The Father Christmas Letters have been published over the years, and a few of those are shown here. The most complete collection to date is the HarperCollins 1999 edition (blue cover above) with a cover depiction of Polar Bear after toppling down the staircase with a trail of crushed gifts in his wake. Variant editions with a unique aesthetic appeal include the HarperCollins 1994 edition consisting of three miniature volumes in a boxed set; and the CollinsChildren’sBooks / Houghton Mifflin 1995 edition, featuring facsimile envelopes with individual letters to pull out and read. “A merry Christmas to you from North Polar Bear. This is the third and final post in a series written by students in Dr. Christine Colón’s Dorothy L. Sayers literature course at Wheaton College. Most people have never heard the word “change-ringing” before or, if they have, they have almost no idea what it means. Dorothy L. Sayers, however, in her novel The Nine Tailors exposed the niche interest of bell-ringing to the world, and the novel became one of the lasting icons of the change-ringing society for this very reason. At the Wade Center there is even a whole archive dedicated to change-ringing in which one can learn about the curious people who have been “bitten by the bug” of campanology. “a team sport, a highly coordinated musical performance, an antique art, and a demanding exercise that involves a group of people ringing rhythmically a set of tuned bells through a series of changing sequences that are determined by mathematical principles and executed according to learned patterns” (Source: http://nagcr.org/pamphlet.html). As this definition highlights, ringing bells is an art as much as it is a mathematical formula, and interestingly, the newspaper article, “Factorial Mathematics and the Art of Change Ringing” reveals that those in charge of the change-ringing group at Kalamazoo College are either retired mathematicians or computer software designers. Why are those so left-brained interested in the art of bell ringing? Well, change-ringing depends upon knowing combinations, permutations, and patterns in order to known when each person should ring their bell. The bells, for their unique combination of being both intellectually and physically challenging while also being musically rewarding, have an intoxicating effect on those who wish to get involved. In the article, the father of change-ringing at Kalamazoo College, Dr. Jefferson Smith, notes, “Not everybody is susceptible to change ringing, but if you can find a student who gets caught up in it, they burn with a hard blue flame” (The Chronicle of Higher Education. September 19, 1997, pp. B10-11. The Change Ringing Archive, Folder 6. Marion E. Wade Center, Wheaton College, Wheaton, IL). It’s intriguing that the people who become interested in change-ringing seem to become “foolhardy aficionados” who can’t stay away from the bells; and since the bells are almost always located in a church, what better mission outreach? This is where we have a unique intersection of the sacred and secular. People who don’t usually attend church now have to in order to ring the bells. And although the ringer might be involved with change-ringing simply for the math or the exercise or the music, it is unavoidable for him/her to partake of the sacred duty of the bells. These duties include calling people to worship and ringing tolls at peoples’ deaths (from tradition this would help the souls ascend to heaven by warding off evil spirits). In The Nine Tailors, the sacred duty of ringing the bells becomes even more pronounced as the bells seem to act as the hand of God enacting judgment on Deacon, an unrepentant criminal. Were the bell-ringers responsible for killing Deacon? To what extent do the ringers get wrapped up in the spiritual nature of the bells? Brian Ashurst wrote an essay titled, “A Thousand Years of Bells: For centuries their mysterious harmonies have expressed the joy of the Gospel” which delves into the intimate connection between the church and the bells. He goes so far as to say that, “the swinging tower bell stands as a symbol of the church second only to the cross” (The Anglican, 10.38 Summer, 1979. The Change-Ringing Archive, Folder 2. Marion E. Wade Center, Wheaton College, Wheaton, IL.) He tracks the dense history of the bells from their early use in pagan rituals to their association with superstition to their modern use with the church and as a hobby. When talking about the bells today, he recognizes that, “there is a growing enthusiasm in this country [England] for change-ringing, as its mysterious attractions for those outside the church as well as for worshipers are seen to justify the cost and effort put in.” Could Sayers’s novel The Nine Tailors have played a role in this increasing interest in change-ringing? And if so, does this make her novel evangelical? Even before Sayers had ventured into writing explicitly about the Christian faith, The Nine Tailors may have had missional possibilities simply for its use of change-ringing. Sayers herself would have agreed that any good writing could glorify the Creator even if it isn’t explicitly Christian. This being said, her use of the bells and their inseparableness from the church reinforce this unique meeting place for the sacred and the secular, and thereby, provide an outreach opportunity to all interested in change-ringing. Rachel Post is a senior at Wheaton College studying English Literature and Art History. While taking the Dorothy L. Sayers class, she enjoyed learning how Sayers herself was interested in both art and literature and how she often drew/sketched out images to go along with what she was writing – whether it be a detective novel or religious play. She enjoyed researching in the Wade Center, and finding Sayers’s sketches (often of cats) pop up in her letters with various people! This is the second in a series of three posts written by students in Dr. Christine Colón’s Dorothy L. Sayers literature course at Wheaton College. The year 2004 marked the 70th anniversary of the publication of Dorothy L. Sayers’s novel The Nine Tailors. And this occasion certainly did not go unmarked by a very unique group of nine people. It all began when the Dorothy L. Sayers Society, a large fan base for the author, wanted a special peal of bells rung for the anniversary. In fact, it was to be the Kent Treble Bob Major, the same peal rung on New Year’s Eve by Lord Peter Wimsey and the group of worthy village men for nine hours. The society wanted someone named Tailor to be one of the ringers, just as an extra touch. But here the true devotion of these fans showed through. It was not enough that they were ringing this complicated peal, or even that only one of the ringers was named Tailor. Oh no. Nothing would do, but that each of the nine ringers would be named Tailor, or some variation on the spelling of the name. Remarkably, perhaps the most remarkable part of the whole story, it was done. E-mailing through the bell-ringers e-mail list, they managed to find nine bell-ringers named Tailor/Taylor. In three hours, they managed a neat job of ringing 5,088 changes, ringing on the nine bells of All Saints’ in Basingstoke, Winchester diocese. When I first came across the article mentioning this story in the Wade Center archives, I was struck by two things: first, that bell-ringers have an e-mail list. Second, that their devotion and the devotion of the Dorothy L. Sayers Society was so great that they would even think to have rung this special peal – let alone in the manner that they did. But this article really speaks to the power and popularity of The Nine Tailors, especially among those few people who are proud to call themselves change-ringers. Change-ringing is definitely what one would call a niche interest. By definition it is the rhythmic ringing of a set of tuned bells, in a changing sequence set out according to mathematical principals and executed by learning the pattern. But if that’s too much of a mouthful, one could really refer to it as a very loud, very long noise. It combines all the best aspects of a hobby in that it is simultaneously an antique art that has existed for hundreds of years, a highly coordinated musical performance, and a team exercise. Typically, a peal is done on a set of six to ten bells, more bells meaning more possible permutations and thus longer peals. Bell-ringing takes a long time to learn and an even longer time to master – ringers who want to ring peals must memorize the distinct patterns that make up the peal, and be able to ring them continuously without error. Those who dedicate a part of their life to learning this craft are likely to find a group of people with whom they can share a lasting friendship. Even with this being true, The Nine Tailors was a huge dose of publicity for a community that was virtually unknown even in England. 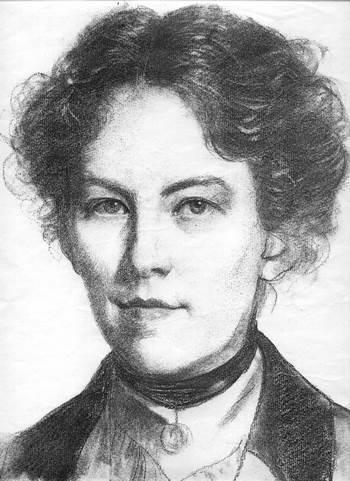 According to Sayers herself, her interest in the art was sparked when she picked up a secondhand copy of Troyte’s Change Ringing and saw the immediate possibility for a cipher in a diagram laying out the method for ringing a particular peal. Geoffrey Lee Alan, in an unpublished paper on The Nine Tailors written for the Dorothy L. Sayers Society, speculated on the strange fascination the art must have inspired in Sayers: “She did nothing by halves, and her determination to master an esoteric and, to her, uncongenial discipline speaks volumes for the fascination that the complex numerical patterns of change ringing exercised upon her mind. It is to this determination, this mastery, that The Nine Tailors owes so much of its coherence and power” (Lee, Geoffrey Alan, “Lord Peter Rings the Changes; A Study of Change Ringing in The Nine Tailors.” Hurstpierpoint, West Sussex, England: The Dorothy L. Sayers Society. Unpublished manuscript. 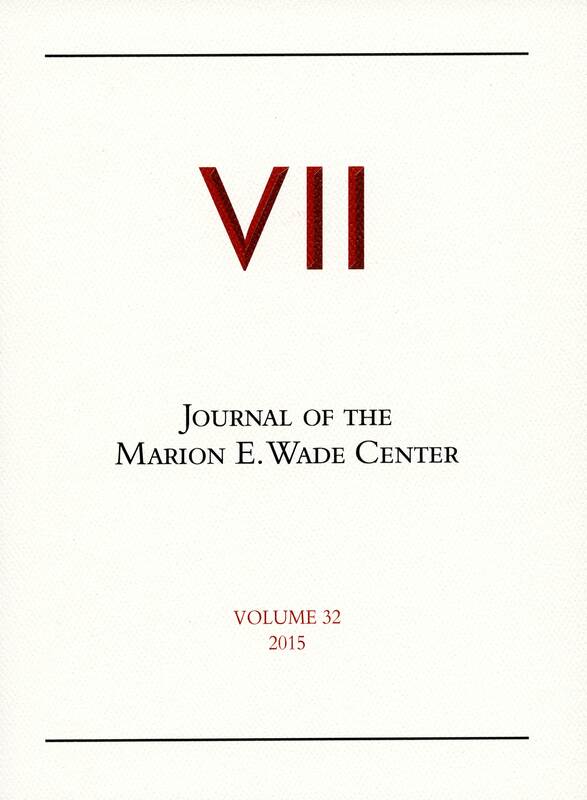 Wade Center Article File). Indeed, one only need look at the reaction of the change-ringers themselves to understand the significance of The Nine Tailors for their community. Sayers received many letters about the book after it was published, and many of those came from different members of the change-ringing community. One admiring campanologist – an individual who studies change-ringing – sent Sayers a letter expressing his admiration and enclosed a pamphlet for a machine he had invented which would work out the mathematical permutations for a peal, once the number of bells and the type of peal had been entered. He also took the liberty of including an itemized list of mistakes he had noticed regarding change-ringing or a peal sequence in the novel – Sayers replied with a vague promise of fixing them in the next edition. “As a Bellfounder and also a Bellringer I read your well known book ‘The Nine Tailors’ with unusual interest, and I venture to express my admiration for the skill with which a really stirring story of a murder was interwoven with a faithful picture of a Parish in the Fen District and of the country Parson and, last but not least, with an accuracy of the foibles of change-ringing that would impel one to believe that the authoress was herself a bell ringer.” (Letter from Gillet and Johnson to Dorothy L. Sayers, 21 October 1936. Dorothy L. Sayers Papers Folder 102, p. 6, The Marion E. Wade Center, Wheaton, IL). This, to a woman who had, at that point in her life, never even heard a peal rung! Sayers, as the daughter of a minister, doubtlessly had heard bell-ringing before. But the sheer amount of work involved in memorizing the sequences to be rung and practicing those sequences for a peal means that these impressive feats of bell-ringing are only done on special occasions. To be considered a peal, there must typically be between 5,000 and 5,280 changes, which can take over four hours to ring. The Kent Treble Bob Major – so named because it was first rung in June of 1774 at Leeds, Kent – has 15,840 changes. In the novel, this takes nine hours – nine hours of endlessly ringing bells. Think about what this must mean for the people on the other end of the ropes! They must control their bells and ring them in their correct sequence. The same person must ring the same bell for the whole peal. Sayers evidently thought this was going too far, as she allows her bell-ringers the scandalous privilege of resting while they ring the Kent Treble Bob Major on New Year’s Eve, by having different people swap places from time to time. This was the worst mistake regarding bell-ringing in the book, if the reaction of bell-ringers in letters is to be believed. (It must be a point of pride for the community). On top of the physical stamina required, the ringers must have the sequences memorized well enough that they will make not a single error – a flawless peal is one of the requirements for recognition from the Central Council of Church Bell Ringers, according to their website. That the 70th anniversary of the book’s 1934 publication should merit the honor of having such a peal rung speaks to the power of Sayers’s writing, and her understanding of the unique interest of change-ringing. One might think that since they were ringing to commemorate the novel, the nine ringers who rang the 5,088 changes would have given themselves a break the way Sayers gave her characters one. But apparently, these ringers were made of stronger stuff than Lord Peter Wimsey. Sayers’s immense respect for change-ringing earned her enough respect and love from the bell-ringing community that they would even think to undertake ringing such a peal for her novel, which speaks to how impactful it was for the community. However, Sayers’s famous wit does not fail to see the ridiculous side to change-ringing. She muses upon how funny practicing for a peal must appear at the beginning of the novel, reflecting that “to any disinterested spectator, peeping in upon the rehearsal, there might have been something a little absurd about the eight absorbed faces; the eight tense bodies poised in a spell-bound circle on the edges of eight dining-room chairs; the eight upraised right hands, decorously wagging the hand-bells upward and downward…” (Sayers, Dorothy L. The Nine Tailors. London: HBJ Book, 1962. Print, p. 18). Elena Basiletti is a senior at Wheaton, studying English Literature with a Minor in Studio Art. She thinks one of the most interesting things about going through Sayers’s materials at the Wade Center has been reading the sheer volume of correspondence Sayers was able to keep up with friends, family, or fans – and finding all the hidden gems of humor and wisdom with which she peppered her letters. This is the second in a series of posts reflecting on Dorothy L. Sayers and her detective novel, The Nine Tailors. It is introduced by Dr. Christine Colón, Professor of English, Wheaton College. A few years ago, the Wheaton College English Department created a Wade Center Authors course that would provide students the opportunity to conduct original research using the Wade Center’s extensive collection of primary materials. In this course, students are required to use these materials as the foundation for a substantial project that offers their audience new insights on the author’s work. This type of research can be challenging for students since it doesn’t follow the typical pattern for research projects that they have used in many of their other classes. Rather than investigating what scholars have said about a topic and then building their own essay as a response to that conversation, students must instead pour over letters, manuscripts, unpublished talks, annotations in books, videos, etc. to see what catches their fancy and provide them with a starting point to discover something new. Anyone who has done this type of research knows the time that it takes to find something that forms the basis for a worthwhile project. Students in Colón’s class researching in the Wade Center Reading Room. In my version of the course, which focuses on Dorothy L. Sayers, students have a particularly rich collection of materials to work with at the Wade Center, which can be both a blessing and a curse. I can pretty much guarantee that students will eventually discover something interesting, but I can’t guarantee that they will be able to find it quickly. With that in mind, I try to help my students become accustomed to this potentially cumbersome process with a short project that we do early in the semester. I begin the course with Sayers’s detective novel The Nine Tailors (1934), so we use that as the foundation for our initial research. The Nine Tailors, which is considered by many to be Sayers’s best detective novel, contains a number of interesting avenues for research. The mystery, which revolves around the body of an unknown man discovered in a country churchyard, opens up intriguing questions regarding technique, as Sayers both utilizes and subverts conventions of detective fiction. The mystery also has fascinating theological resonances as Sayers uses a number of coincidences surrounding the death and investigation to encourage her readers as well as her detective, Lord Peter Wimsey, to think about providence and divine justice. And, perhaps most famously, the mystery is embedded in the traditions of bell ringing, which Sayers studied very carefully in order to craft her novel. The title of the novel refers to the tradition of tolling a church bell nine times to indicate the death of a man in a parish, and with it Sayers indicates just how important the bells will be in the mystery that follows. After reading and discussing many of these issues in class, students then have the opportunity to explore the Wade Center’s collection and see what interesting information they can find that might provide them with new insights. This year, students were challenged to present that information in blog posts for the Wade Center so that they could share their findings with an audience outside of the class. In the posts that follow, three of my students present the results of their research. Christine Colón is Associate Professor of English at Wheaton College. She is currently completing a book entitled Writing for the Masses: Dorothy L. Sayers and the Victorian Literary Tradition to be published by Routledge. She will also be presenting three lectures on Sayers for the 2017-2018 Hansen Lectureship entitled Community or Chaos? : Searching for Clues in the Works of Dorothy L. Sayers. All three lectures will be recorded and available for viewing on the Wade website, and eventually published along with faculty responses by InterVarsity Press Academic. The first lecture in this series, “Dorothy L. Sayers’s Vision for Communities of Action” will be given on November 2, 2017. Following is the first in a series of three posts written by students in Dr. Colón’s Dorothy L. Sayers literature course. When the BBC decided to make a series based on Sayers’s detective stories, they were faced with the task of portraying Lord Peter Wimsey, Sayers’s detective, on screen. Lord Peter is a pretty steady character throughout the first part of the series, but later, beginning with The Nine Tailors, he undergoes a gradual humanizing process that expands and deepens his character. As a writer, Sayers was always extraordinarily dedicated to preserving the integrity of her characters. In The Mind of the Maker, she speaks of the importance of allowing the characters to develop naturally and freely, without any jarring shifts; and her own writing reflects this principle. As a result, Sayers’s characters are very strong and memorable: respected by her and beloved by the fans. The BBC sought to make its version of Lord Peter consistent with what the fans knew and loved, taking liberties with the plot and exposition instead of with the characters themselves. However, not all movie producers were as thoughtful; some tried to capitalize on the fame of the characters without respecting their integrity, which caused Sayers a lot of trouble when they tried to adapt her work to the screen. The first movie production of Sayers’s work was The Silent Passenger, produced by Hugh Perceval in 1935. Sayers was contracted to write a short story from which the company would create a script, which Sayers would then edit. She wrote the story, sent it in, and waited. After repeatedly pestering the producers, she finally got a look at the script – and what a script it was! “They have . . . turned Wimsey into a kind of Gaiety-Bar lounger,” she complained, instead of the “straight high-comedy part on the ‘great gentleman’ lines that I have tried to lay down for him.” She wrote back to the producers, demanding that they change Peter’s character back so that it matched that of the books, or else remove his name and hers from the production. “I have included a character sketch” she said, “of Wimsey’s character as he is known and genuinely beloved by thousands of people” (Letter from Dorothy L. Sayers to Peter Haddon, March 23, 1935. The Letters of Dorothy L. Sayers: 1899-1936: The Making of a Detective Novelist, p. 346). Haddon, the young actor who played Peter Wimsey in the film, was sympathetic to Sayers and sought to help her protect her characters. Sayers, in turn, was grateful for his support and determined struggle against the producers to preserve Peter’s character. It is always something of a shock to see the characters that we know and love from books portrayed on screen. However, it is obviously impossible for a movie to meet the expectations of every member of the audience. When I first saw the 1974 BBC series of The Nine Tailors, the thing that stood out the most to me was the change in exposition: the initial burglary is committed on screen and several important clues are given away at the very beginning. Additionally, Peter seemed much more confident and intellectually invincible than I remembered his portrayal from the book. The Nine Tailors, as Sayers wrote it, represented the beginning of a shift in her writing. She wanted to ennoble the genre of detective fiction by writing books that combined well-crafted mysteries with more serious themes and character development. Thus, Peter himself begins to develop more as a character in The Nine Tailors and in the books that come after it; he loses his untouchable veneer and shows himself to be extraordinarily human. The humanization is a prerequisite for his marriage with Harriet Vane, whom he saves from execution in Strong Poison. Sayers, with her devotion to character integrity, saw that Peter and Harriet, as they were at the end of Strong Poison, would not marry each other; and so she went through the slow, painful process of developing them and letting their relationship grow naturally. In this way, Harriet was the main cause of Peter’s transformation. In the BBC series, however, Ian Carmichael plays Peter very much as he appeared in Sayers’s early books. Does the BBC, by portraying him like this, disrespect Sayers’s desire to maintain her characters’ integrity? Not necessarily. First of all, viewers instantly recognized in Carmichael the Wimsey they knew and loved from the books. “There’s little doubt that Ian Carmichael was born to play society super-sleuth Lord Peter Wimsey,” says one critic (yvettecandraw.blogspot.com). Sayers’s main problem with the original script of The Silent Passenger was that it altered the characters so that they were virtually unrecognizable. However, the Peter in the BBC show is consistent with the Peter from the earlier books; though he does play this part a bit more seriously than in his previous episodes, becoming, in the words of Amazon reviewer F. Behrens, “far less Bertie Woosterish.” In addition, the added flashbacks make Peter a more relatable and human character, creating a similar effect to that of the book without substantially changing his character. Although the BBC gives us new insights into his history, this is virtually the same Peter portrayed all along: the smart, dashing, detached detective. This, in a way, shows respect for the integrity of his character. They kept his character constant through all five of their movies. Their series dealt with Peter’s detective arc, not his romantic arc; therefore, the character development that Sayers gave him to make him a suitable partner for Harriet would have been out of place in the Harriet-less TV series. Although their portrayal of Peter is different from that in the book, it is constant with the character they have created for him and which was shown in the earlier books. Instead of showing Peter change and become more human, they invite the audience to witness scenes from his past, making him more relatable and creating a greater sympathy for him. Thus, paradoxically, these subtle changes to the structure of the story demonstrate a greater respect for Peter’s character integrity than just mindlessly copying the scenes and dialogue from the book. In this way, the BBC has created a recognizable, consistent character, who is different from the Peter Wimsey of the Nine Tailors book simply because he lacks the catalyst for development – Harriet Vane. Instead, the deepening of his character comes from the added flashbacks, which maintain his character integrity while allowing the audience more access into his past life. Carolyn Greco is a senior at Wheaton College majoring in English Literature. She likes Sayers’s clear insight and her sense of humor. This blog post begins a series of posts reflecting on Dorothy L. Sayers and her detective novel, The Nine Tailors. The Marion E. Wade Center co-authored this post with Seona Ford and Jasmine Simeone, Chair and Secretary, respectively, of the Dorothy L. Sayers Society. It was during her time working for an advertising agency in the early 1920s that Dorothy L. Sayers first decided to try her hand at writing a crime novel. Detective fiction writing was a popular enterprise at the time, and Sayers’s first novel Whose Body? appeared in 1923. Her efforts writing detective novels earned her success, the financial and creative freedom to become a full-time writer, and secured her place among the great authors of detective fiction. She wrote 11 novels featuring her aristocratic detective, Lord Peter Wimsey. One of the most highly acclaimed novels in the series, declared a masterpiece by connoisseurs of the genre, is The Nine Tailors which was first published in 1934. The Nine Tailors is considered a great work not just because it is a well-written piece of prose, or an inventive and original story, or because it includes well-loved characters old and new, or because it is well-structured, or because it documents a time gone by. It is all of these things, but it is also an exciting and very readable story which stands the test both of chronological time and also in the sense that it can be re-read many times and still offer something new to the reader. The book takes as its core supposition the idea that in an English country village each person has his/her own place: as in the course of bells in a peal where each bell has its place. If a bell rings out of place it throws the whole peal into a cacophony of noise. Similarly, if a villager behaves out of place, does something to upset the quiet order, then the whole structure falls apart. This makes the book an especially historically perfect record because as the remnants of the village men returned from the First World War, often having gone together as whole platoons under the command of their local Lord, and returning with holes in their order caused by the fallen, they found that their village had to change to accommodate first the absent men and then the losses. Village life in England would never be the same again, and in the 1920s when this book was set, the age-old village was in its death throes. Sayers knew from first-hand experience what the structure of an English village was like before World War I as her home in the Fens was in such a location. Her father, Henry Sayers, was the vicar at the local church which functioned as the center of the community; a role which church buildings continue to embody in English villages today even if the church is not much used. Manuscript pages from THE NINE TAILORS by Dorothy L. Sayers. Photo by Carlos Vergara. The Dorothy L. Sayers Society was founded in February 1976 to promote the life, works, and thoughts of Dorothy L. Sayers. It began after some members of Witham and the Countryside Society fought a fierce and effective battle to stop the demolition of a little row of houses in the late 1960s, which included the home where Sayers died in 1957. The Bulletin of the Society began publication in March 1976 and continues to be published every two months; sent to a worldwide membership of about 500 persons with about half in the UK and the other half divided between the USA and Europe. There are members as far as New Zealand and Australia, Japan, Russia, India and Singapore. Each year the Society celebrates the anniversary of a book or play, and on June 13th remembers Sayers’s birthday. Membership is welcome to all who enjoy her work. Details may be found on the Society Website and through the Society’s presence on Facebook and Twitter. 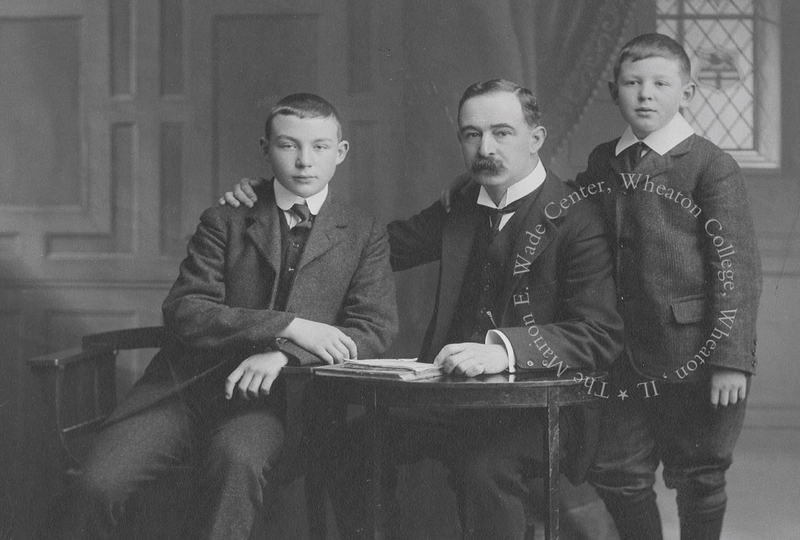 The Marion E. Wade Center has had strong and valued connections with the Dorothy L. Sayers Society from its very earliest years, when Dr. Clyde S. Kilby, Wade founder, helped the fledgling group by overseeing subscriptions from American members. We are very grateful for the significant contributions the Society has made to Sayers scholarship as well as the numerous ways the Society helps readers experience greater delight and understanding of her writings. If you already enjoy Sayers’s books or would simply like to learn more about Dorothy L. Sayers and her diverse works, we warmly encourage you to join the Sayers Society. Gilbert and Frances ca. 1904. This photo is property of the Marion E. Wade Center and may not be used without written permission. Click image to enlarge. From the beginning, faith was a part of the relationship of Gilbert and Frances Chesterton. As a young man Gilbert Keith Chesterton, journalist and Marion E. Wade Center author, was interested in Christianity, but never knew anyone who actually practiced it. His future wife Frances read the Bible and taught Sunday school. She attended services faithfully each weekend. Besides that, she visited the sick, took care of the elderly, and served the poor in her neighborhood. She wasn’t just paying lip service to Christianity—she was living it. This attracted the young author, and intrigued him—as she intrigues us. It is often interesting to discover more about a famous writer by getting to know their spouse. Who was this remarkable woman? 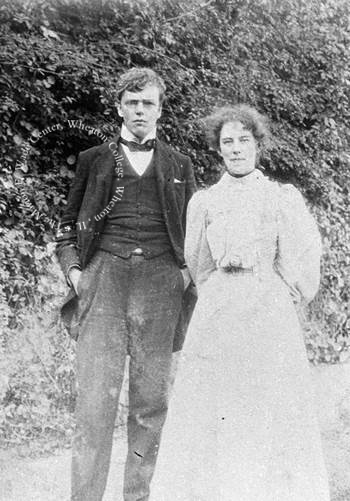 Francis Alice Blogg Chesterton. Drawing by Alfred Priest, ca. 1906. Click image to enlarge. Frances Alice Blogg was a shy Victorian girl, the eldest in her family. She was born June 28, 1869 and raised in London, a city girl who discovered she loved gardening and country living. Her mother believed in modern education, and sent Frances and her sisters to the very first kindergarten in London. After Frances attended primary school, she was sent to a high school for girls that operated along academic lines to prepare the girls for higher education. This was novel in the late 1800s, and Frances’s younger sister Gertrude was one of the first of a group of students to sit for the Cambridge Examinations. While she was in high school, Frances began writing poetry. “How far is it to Bethlehem? Lit by a star? . . .
Frances took after her mother in being drawn to the educational field, and after high school she attended college to become a teacher. It was during her time at this school, St. Stephens College, run by the Anglican Clewer Sisters of St. John, that Frances became a devout Christian. The daily routines of mass and the prayer life there were congenial to Frances, and she adopted devotional practices then that would last her lifetime. After college Frances tutored students for a few years, and then took a job in 1895 at an educational institution called the Parent’s National Educational Union (P.N.E.U.) run by Charlotte Mason. Frances became the organization’s general secretary and administrator. She planned conferences, organized a lending library, took notes at meetings, gave speeches, edited their newsletters and magazines, and kept track of expenses. Frances worked for the P.N.E.U. for five and a half years, from 1895 until she married Gilbert in 1901. Frances and Gilbert ca. 1898-1900. This photo is property of the Marion E. Wade Center and may not be used without written permission. Click image to enlarge. Frances’s family lived in London’s first suburb called Bedford Park. It was a bohemian neighborhood, filled with artists, poets, socialists and communists. Frances’s mother, now a widow, loved the atmosphere. The Blogg family entered fully into the life of the neighborhood, and started their own debate club, called the I.D.K. Debating Society. (When members were asked what the initials stood for, they were to shrug their shoulders and say, “I Don’t Know.”) Lucian Oldershaw heard of this club through a friend and began visiting the interesting family with the hope of courting one of the beautiful sisters he found living there. Oldershaw, along with Gilbert Chesterton, Edmund Clerihew Bentley, and many of their other school friends had started their own debate club back at St. Paul’s when the boys attended that institution. He told Chesterton about the Blogg’s debate club, and indicated that there were three attractive sisters in the household. And so it was that Chesterton went visiting one day at the Bedford Park home and met Frances Blogg. A short time afterwards they were engaged, and in 1901 they married. Frances became Gilbert’s secretary, as well as his marketer, organizer, and biggest fan. It was said that things Chesterton said one day, Frances repeated the next day—not because she was blindly following, but because she believed he was right. Although they were never able to have children, the Chestertons hosted numerous children at their home in Beaconsfield, were very close to their nieces and nephews, and counted over 25 godchildren. Within a few years of their marriage, Frances would suffer her own crisis of faith when her brother committed suicide. In her distress and grief she sought the advice of a spiritual medium. While Frances sat with the medium, Gilbert composed a poem expressing his frustration with her choice, and reminding his wife of the faith which had been strong enough to convert him. Frances repented, and never sought this kind of advice again. And so would the remainder of their marriage go: Frances helping Gilbert out of a depression or over an illness, and then Gilbert helping Frances in the same way. They were two lovers who needed each other very much, who helped each other, wrote love poems to each other all their married life; and prayed with and for each other, sometimes with hands twined together. This was the key to their relationship: their shared faith. 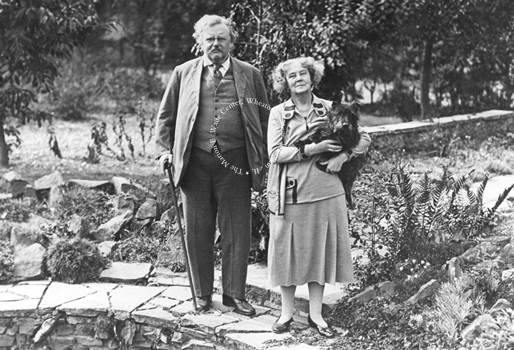 It was the force which kept them together for 35 years, until Chesterton’s death in 1936. 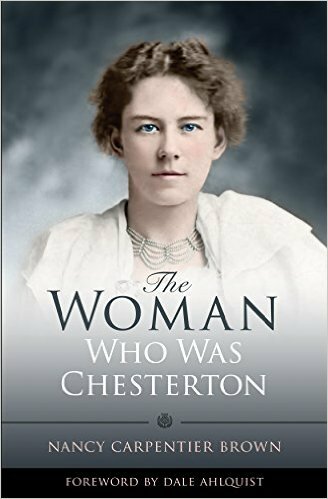 This remarkable woman, Frances Chesterton, kept Gilbert grounded, and was in all ways his helpmate. He could not have written all he did without her support, encouragement, and prayers. Gilbert and Frances, 1930. This photo is property of the Marion E. Wade Center and may not be used without written permission. 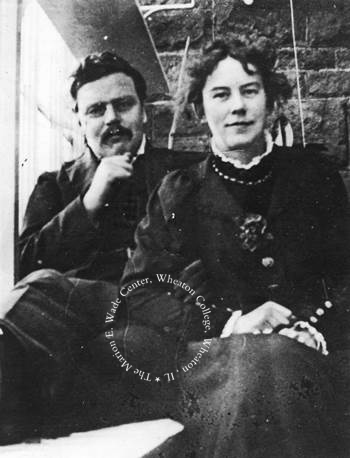 To learn more about Frances and G.K. Chesterton, visit the Reading Room and view the resources at the Marion E. Wade Center at Wheaton College. Nancy Carpentier Brown is the author of two works concerning Frances Chesterton, both books researched extensively at the Wade Center. 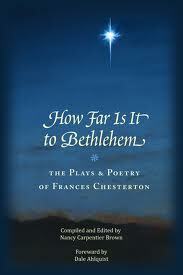 How Far Is It To Bethlehem, the Plays and Poetry of Frances Chesterton (2012) contains all the known writings of Frances Chesterton, and The Woman Who Was Chesterton (2015) is the only full-length biography of Mrs. Gilbert Keith Chesterton. 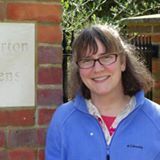 Brown won the Kilby Research Grant for her work related to Frances Chesterton in 2011.